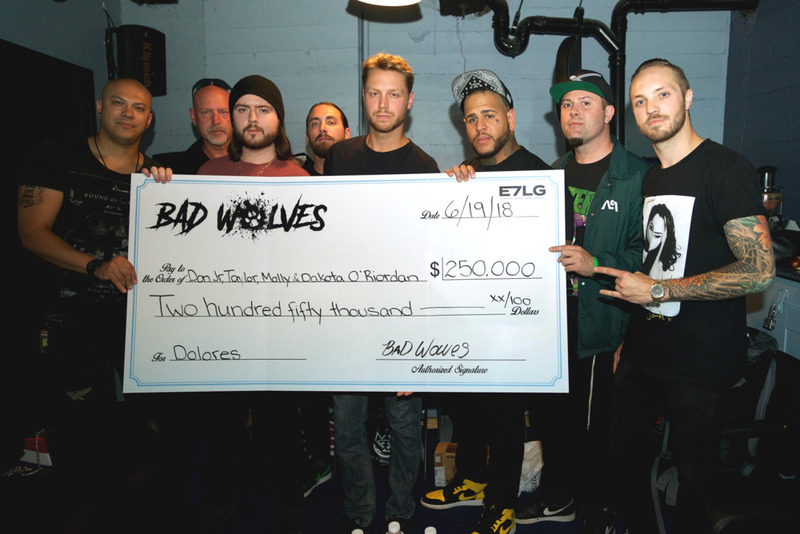 Last night at a sold out Gramercy Theatre in New York City, Bad Wolves presented a $250,000 check to Dolores O’ Riordan’s family onstage prior to a performance of “Zombie”. O’Riordan’s two sons, Donny Jr. and Taylor Burton, alongside their father, Don Burton, were presented with the gift in an emotional moment. The check was also accepted on behalf of their younger sisters, Molly and Dakota Burton. O’Riordan was set to record her iconic vocals on the track on the day of her tragic passing. In advance of their debut album, Disobey, the band released “Zombie” as a single, with the commitment to bestow their proceeds to her four children. The unprecedented global success of “Zombie” lead to the raising of $250,000, with a promise for more. Bad Wolves’ “Zombie” has been certified Gold in the United States and Australia, as well as gaining Platinum status in Canada. The track has topped charts worldwide, including the U.S. iTunes overall and rock charts, Billboard’s Mainstream Rock Songs chart, Spotify’s Global Viral 50 chart, while also reigning atop the Active Rock radio chart for three straight weeks . Bad Wolves have also earned the #1 spot on the Billboard Emerging Artists chart. Additionally, the single has been planted atop the iTunes Metal chart in the U.K. and Germany for five straight months. The official music video, a tribute to O’Riordan and an homage to the original, has garnered over 125 million views across platforms. Their debut album, Disobey, released in May via Eleven Seven Music, achieved the #22 spot on the Billboard Top 200, #2 on the Hard Rock Chart, #4 on Rock, and #8 on the Top Current Albums Chart. Consisting of vocalist Tommy Vext (ex-Divine Heresy), drummer John Boecklin (ex-DevilDriver), guitarist Doc Coyle (Vagus Nerve, ex-God Forbid), guitarist Chris Cain (Bury Your Dead), and bassist Kyle Konkiel (ex-In This Moment), Bad Wolves have proven themselves to be the global breakout band of 2018. Bad Wolves will be touring extensively throughout the rest of 2018, with the “What’s In Your Head” tour continuing through July 6th with label mates From Ashes to New and special guest Diamante. They will also be joining Five Finger Death Punch, Breaking Benjamin and Nothing More on their massive amphitheater tour this summer. For tickets, VIP packages and more information, visit www.badwolvesnation.com.